Red Bull KTM’s Ryan Dungey notched his seventh 450 SX race win of the year in Santa Clara. GEICO Honda’s Eli Tomac finished in second followed by JGRMX’s Weston Peick, who earned the best result of his career, in third. Autotrader Yamaha’s Justin Barcia got a great start and ran out to the front ahead of TwoTwo Motorsports’ Chad Reed in second and Dungey in third. Barcia didn’t face heavy contention for the top spot right away, as Reed fought to play defense against Dungey in the opening laps. Reed began to close in on the Yamaha on Lap 3, but then he came up short in a rhythm section and went down. Barcia sped off and Dungey slipped easily past into second. Reed remounted, but was near the back of the pack when he finally got back in the game. The following lap Dungey lined Barcia up and made a quick, clean pass for the lead. Further back, Peick pushed into third position while behind him, Tomac was on a charge up the ranks. Soon after, Peick dispatched Barcia for second-place and then Tomac did the same for third. Mid-way through, Tomac had Peick in his sights for the runner-up spot and eventually made the pass. Peick remained steady in third while riders behind fought hard for fourth-place. Barcia remained there for a period, but had Rockstar Husqvarna’s Jason Anderson, Yoshimura Suzuki’s Blake Baggett, Team Honda’s Cole Seely and BTO Sports’ Justin Brayton coming up fast. Positions changed hands numerous times in this group and in the end, Anderson prevailed with fourth-place. Seely finished in fifth followed by Baggett in sixth and Brayton in seventh. Reed rallied after his early wreck to take eighth followed by Brayton’s teammate, Andrew Short, in ninth. Reed’s teammate, Josh Grant, was unable to line up after qualifying for the main event, his machine side-lined with a technical issue. Dungey won the 2015 title during the last round and extends his total points take to 343 after Santa Clara. Tomac is firmly in second, with Seely, in third, trailing by 19 points. Reed sits fourth followed by Honda’s Trey Canard in fifth. Yamalube Star Racing’s Cooper Webb topped off the 250 SX West points season with one more win in Santa Clara. Red Bull KTM’s Justin Hill finished the night in second-place followed by CycleTrader.com’s Alex Martin in third. The main event started with one of the gnarliest first-turn pile-ups of the year. Riders closed in tight to take the left hander but then in the middle of the pack Monster Pro Circuit Kawasaki’s Chris Alldredge clipped Rockstar Husqvarna rider Zach Osborne’s rear tire. This set off a chain of events that took down nearly the entire field. Team 100’s Josh Hansen managed to avoid any of the chaos and he ran out to the lead. Martin trailed in second with Webb’s teammate, Aaron Plessinger, following in third. Webb was back in ninth, having been one of the quicker riders to remount after the first turn mess. By Lap 3 he was up to fifth and charging hard. Meanwhile, Plessinger had slipped up to second and was challenging Hansen for the lead. On Lap 4, the Yamaha rider got past Hansen for the front. Plessinger managed to hold the number one spot for a few laps, but then lost the front and went down on Lap 7. This allowed Hansen to retake the lead, followed by Martin and Webb, who was still on a tear. The following rotation saw Webb get past Martin into second place, then Webb set his sights on Hansen for the lead. When the Yamaha ace made his attempt, Hansen answered back and regained the top spot. Webb had too much though and was able to retaliate soon after, throwing an enthusiastic fist pump as he was mid-pass through a rhythm section. Hansen’s fortunes only got worse from there. Just a few corners later, the Kawasaki rider pulled off and proceeded to the pit area, his bike suffering a technical issue which ultimately ended his night early. Behind, Plessinger had another crash, this time drifting too far right on landing trying to avoid landing on a lapper. He landed instead directly on the tuff blocks and went toppling over the front of his bike. He sprung back up from that one and rejoined the fight, however, and ended up placing seventh at the checkers. Webb was untouchable once out front, and the final laps were spent building a four-plus second gap on the field. Hill battled his way up the ranks throughout the contest and was able to break into second-place with five laps remaining. Martin, the only rider from the original lead group, kept steady to the finish for his second podium of the year. GEICO Honda’s Malcolm Stewart was even further back than Webb after the first turn pile-up and ended the night in fourth. Troy Lee Designs’ Shane Mcelrath came from behind as well to take fifth followed by XPR Motorsports’ Jackson Richardson in sixth. Webb adds 25 more points to his take for the year, leaving Santa Clara with 186 total. Mcelrath is second followed by Osborne in third and Hill in fourth. Barcia got the holeshot in this one but before long he started sliding back pretty quickly. He would have finished farther back but Tickle crashed while going for a pass when he landed on the back of Barcia. Barcia survived without crashing but Tickle had to remount. Chad Reed had a good start too, but he came up short on a triple in a rhythm lane and restarted in dead last. Up front was Ryan Dungey, who did what he’s been doing all season—getting a good start, working into the lead and clicking off laps. Eli Tomac got a mediocre start and was taking small bites out of Dungey’s lead, but it wasn’t enough. Dungey took another win, followed by Tomac and Weston Peick, who took the first podium of his career. 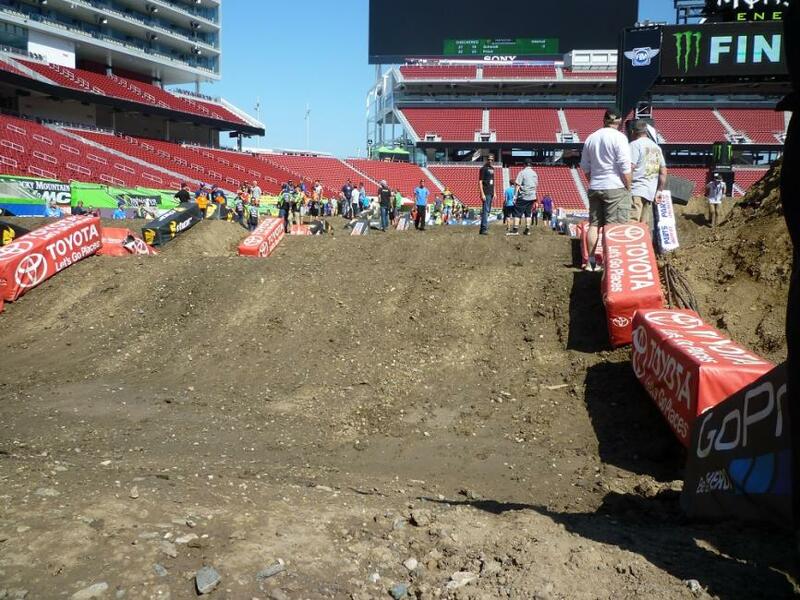 The 250 main started off with one of the biggest first-turn pileups of the year. Tons of guys went down, with Zach Osborne getting the worst of it by far. Most everyone popped back up pretty quickly though, and there was no restart. Josh Hansen was the benefactor, and he took off with a decent lead up front. But Aaron Plessinger hunted him down and started checking out, only to go down all by himself when he pushed the front in a corner. Several laps later he went down again, and at race’s end all he could muster was seventh. Back up front Cooper Webb was charging and was challenging Hansen for the lead. Webb pulled alongside Hansen in the whoops but Hansen stood him up in the following corner. But then Webb pulled out the scrub of scrubs in the next triple and took command of the race. Half a lap later Hansen pulled off with what looked like mechanical problems and pushed his bike out of the stadium. At this point the guys were pretty spread out, with Justin Hill second, Alex Martin third, and Malcolm Stewart fourth. It stayed that way till the checkers too, with Shane McElrath founding out the top five. Even though both championships are wrapped up, there’s still plenty to talk about, and right now the big news is the termination of Davi Millsaps’ contract with Monster Energy Kawasaki. There are plenty of rumors swirling, but right now the people who really know what’s happening aren’t saying much and the team isn’t even here—the truck literally didn’t show up. Kawasaki isn’t disclosing any further details, and for legal reasons, probably won’t. You can read Millsaps’ latest statement here. If any solid info pops up we’ll be sure to let you know. 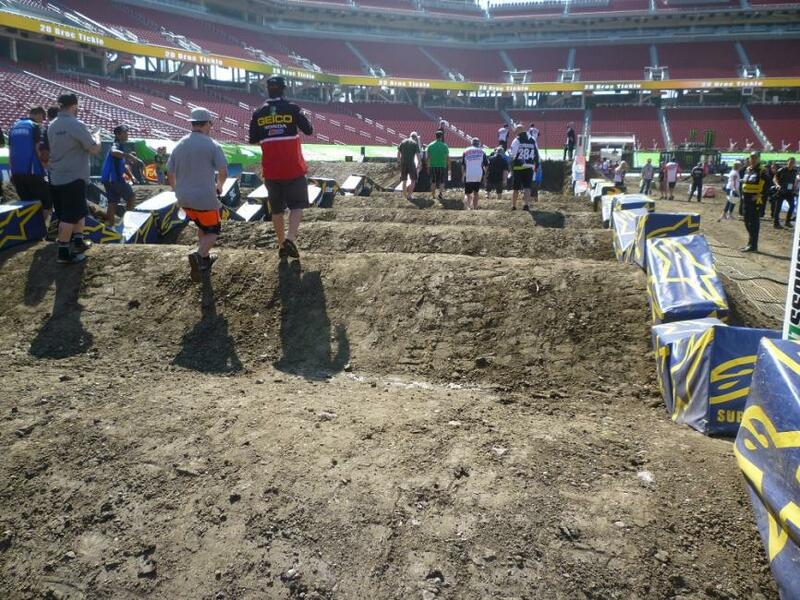 The whoops definitely aren't small, but the sets aren't extremely long. One thing we do know for sure is that the racing will continue tonight. The track itself looks pretty challenging with steep jump faces and big whoops, and the whoop section is broken up by a steep wall jump in the middle. The dirt is very rocky, so much so that endurocross jokes and Unadilla references were the norm during morning track walk. Don’t be surprised if some of the riders throw on handguards. Rocks like these are all over the track. Practice sessions are scheduled to start shortly, so make sure to visit this feed again soon. You can also catch the action via Twitter, @racerxonline.